If you or you’re children are potty for Harry, then our Harry Potter themed shoot is going to be perfect for yourself or your budding little Harry! 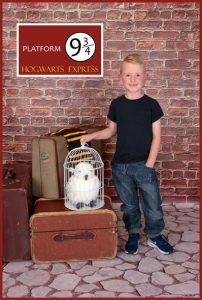 Visit our Studio in Hebburn, Tyne and Wear, you will start your journey on our own platform 9 & 3/4's then we will kit you or your children out in Gryffindor style Harry Potter Costumes complete with Wand, Scarf and Glasses, before you enter our themed set and the magic begins! Our last Harry Potter Themed shoots for 2017 are now fully booked. If you would like to find out when our Hogwarts Train will next be departing please complete the form at the bottom of the page and we will let you know when the next Days are planned. 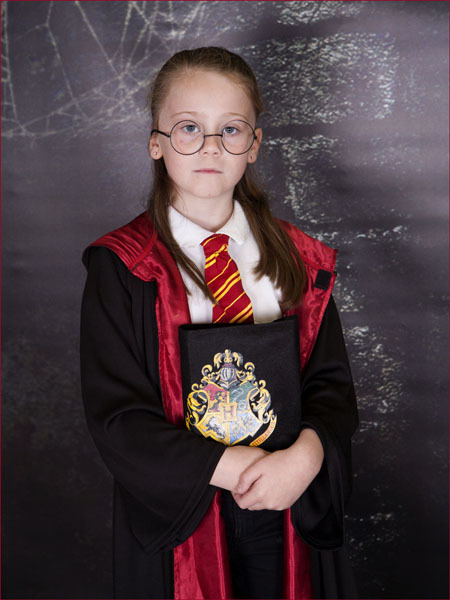 Our Harry Potter Themed shoots are Ideally for children aged from 3 years old we also have robes to fit the big children too! so adults are also welcome to join in too. We would ask that you bring along with you back trousers or skirts, black shoes with tights or socks for girls and a white collared school blouse or shirt. The set is perfect for 1 person at a time max 2 to 3 depending on age and size at any one time. Which includes a 45 - 60 minute mini session for a maximum of 2 children at a time and includes your photoshoot experience and one mounted 12" x 8" print of your choice.